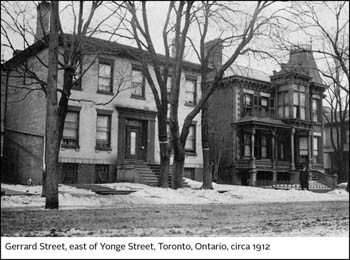 The region known as the Ward - long ago demolished - was a working-class neighbourhood of Toronto located quite close to the Arts and Letters Club. Officially called St. John's Ward, the area was overcrowded, rundown and rough. The families living there were mostly poor immigrants, merchants and labourers. When Canada entered World War I, they saw an opportunity to improve their circumstances. The army represented a steady paycheque, and like many other Canadians, residents of the Ward enlisted thinking the war would be won and over quickly. Brutal reality rapidly set in. Toronto had a population of 400,000 at the time and lost 10,000 young men. This loss was felt with particular pain in the Ward, from where so many had enlisted. 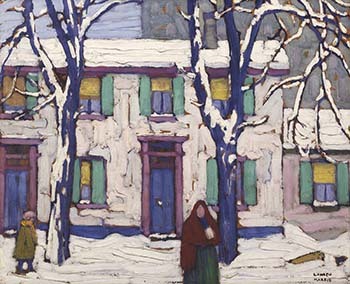 Lawren Harris, from a wealthy upper-class background, was also scarred by the brutality of the war. He lost his brother Howard in the trenches and fellow painter A.Y. Jackson was wounded in action. In addition, back at home, Tom Thomson - an expert canoeist - drowned mysteriously on Canoe Lake. When Harris was discharged and sent home in 1918, he wandered the Ward, sketching and writing poetry, trying to make sense of things, knowing all too well that terrible losses had been suffered by the people there. War is a great leveler, and Harris's social conscience was acute in these years. Harris painted several versions of street scenes in the Ward, changing the composition, reversing the figures back to front and altering the colours of his palette. Here, we have a bright scene wherein Harris uses a palette of cheerful colours together with a large amount of white. His brushwork is especially effective and interesting: the white strokes on the house front could be stucco, yet they echo in treatment the brushwork in the snow and on the rooftop, so likely are snow. All aspects of the scene are handled with a striking, painterly effect that takes precedence over everything else, and one can hardly help but be caught in the movement of the brush-strokes and delight in the colour of this arresting work. The figure of the child, dressed in a heavy coat with a hat and scarf, walks purposefully through the snow, while a woman in a red shawl looks out at us. She is also intriguing; facing us yet faceless, she seems to represent the loss that the residents of the Ward suffered. She is a universal figure, representing no one and everyone at once. Her engagement with us, and thus her engagement with the artist while he was in the act of painting this work, is of even greater significance, and seems to represent a shared sense of understanding and a moment of mutual respect. This feeling permeates all of Harris's paintings of the Ward. They are a poignant part of his oeuvre; not only are they remarkably beautiful, they are also compelling and multi-layered. We can appreciate their appearance - the brushwork, the colour and light alone are enough to engage us in extended periods of satisfying gazing - but when we understand the significance of the Ward for Harris at this challenging time in his life, our regard for these works reaches another level. His ability to paint something that was undeniably tragic with such beauty and understanding is no small thing, and doing so required a profound sense of mutual respect, honest human understanding and, above all, Harris's particular artistic talent. The Hammer Museum in Los Angeles and the Art Gallery of Ontario in Toronto are partnering on a major exhibition entitled The Idea of North: The Paintings of Lawren Harris. The exhibition is curated by Steve Martin in collaboration with Cynthia Burlingham, Deputy Director, Curatorial Affairs at the Hammer Museum, and Andrew Hunter, Fredrik S. Eaton Curator, Canadian Art, at the Art Gallery of Ontario, and will open on October 11, 2015 at the Hammer Museum and in 2016 at the Art Gallery of Ontario.